I knitted my first pair of socks 5 years ago this month. (Happy sockaversary me, yay!) My aim is to have at least 8 machine-washable pairs, then I can wear hand knitted socks every day in winter without having to do a sock wash more than once a week. 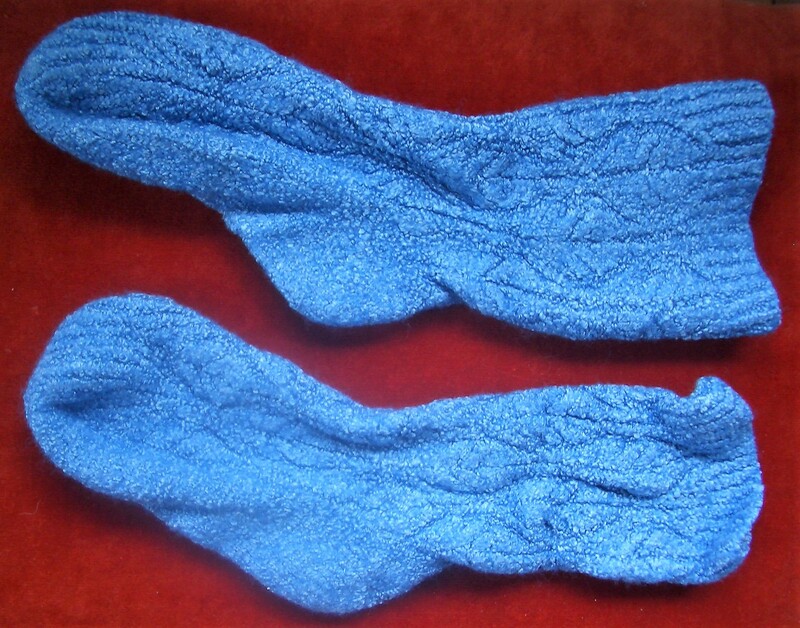 The first couple of pairs I knitted were in luxurious, silky yarns that were wonderful to wear but had to be hand washed. Inevitably, my dear husband threw a pair in the washing machine by mistake and shrank them beyond redemption. 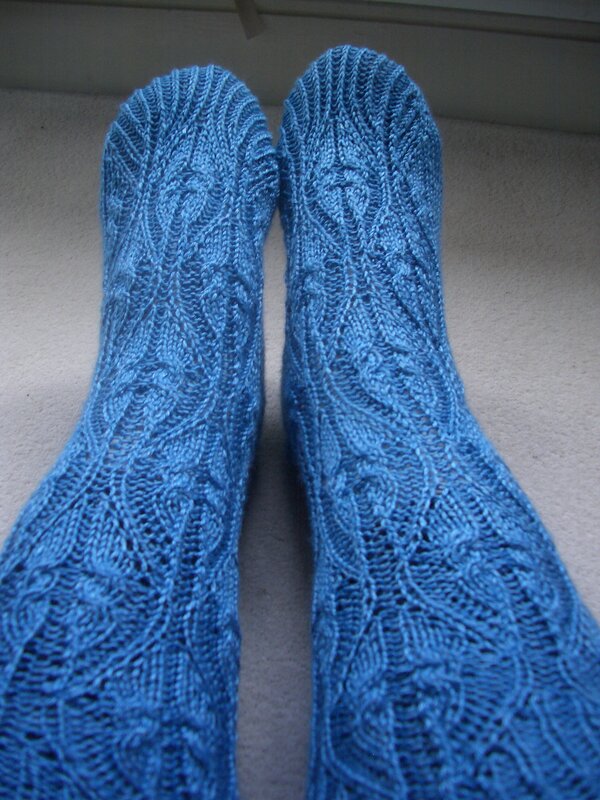 These socks were knitted from a charted pattern (Sacre du Printemps) that had to be followed row by row and took me ages, and they were shrunk after only the second time of wearing. I’ve kept them because I can’t bear to throw them away and I keep thinking that one day I might need a small protective case for something. But anyway, after that disaster I made two changes: firstly, we now have a fluorescent yellow bag in the bottom of the laundry basket into which I place hand wash only items and I am the only person allowed to touch its contents; and secondly, I only knit socks using superwash yarn now. Unfortunately, that hasn’t prevented another sock-related laundry mishap. 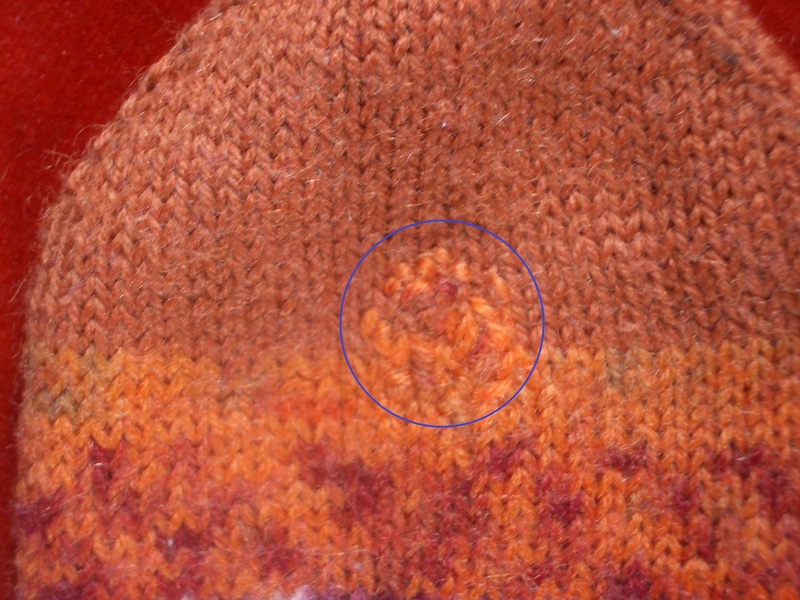 When I hung out one of my lovely orange Drops Fabel socks on the line recently, I saw to my horror that there was a hole on the underside where a strand of yarn had been broken. It must have caught on a bra hook in the washing machine, I have had to detach the odd bra from a sock before. The fact that I spin everything at 1,200 rpm to minimise the drying time probably doesn’t help. Of course, I know I should put delicates into a lingerie bag before committing them to the front-loader, but my last lingerie bag fell apart years ago and, frankly, most of my underwear is in such a state that new holes and rips go unnoticed. While I can live with damage to my M&S* smalls, I’m not prepared to countenance holes in hand-knitted socks that I have laboured over for many hours. Something had to be done. The first job was darning the sock. Out came the darning mushroom that I’ve had since I was 9 and was required to take one to school. (Those were the days.) As luck would have it, the hole was in the only pair of socks I’ve ever made using two different yarns, and it straddled the boundary between the patterned foot and the plain toe. I darned it with the patterned yarn because the plain orange is destined to become part of a stripy jumper, if I ever get around to finishing it. It’s not the neatest bit of darning you’ll ever see, but as usual I was aiming for function over form, substance over style. The darn’s on the sole so no one is going to see it, even if I take my shoes off. The next task was to make sure no more washing day sock horrors occur: I was in need of a lingerie bag to protect my hand-knitted delicates from the ravages of the husband washing machine. In the past I’ve used a bought bag made of mesh with a zip along the top, but the mesh was quite large and bra hooks caught in it very readily, while the zip had a tendency to come undone. I replaced that with a cylindrical bag I made from plain net curtain fabric closed by a drawstring fastened with a spring toggle, but that wasn’t a complete success either because the contents of the bag collected in a tangle at the bottom. They took a lot of separating and probably didn’t get a very thorough wash. I came to the conclusion that a flat, rectangular bag is probably best to give a big surface to volume ratio, allowing the wash water and rinse water to pass through easily. Amongst my fabric stash I found two long thin rectangles of white netting, both the same size and shape but one with silver stars all over it has a slightly smaller mesh. I wonder what I bought them for – one of life’s mysteries. I also looked for some conventional fabric to strengthen the seams because sewing netting is tricky, there are more holes than threads which means most of the stitches don’t actually do anything useful, and it stretches horribly. I wanted something hardwearing that wouldn’t hold too much moisture, and a couple of offcuts of polycotton sheeting seemed to fit the bill. Next I needed to fasten the bag securely. Maybe an nylon invisible zip? They always require a good hard pull to open and close them, although they can be prone to sticking after a few years’ use. I didn’t have one of the right length anyway, and I was reluctant to cut down a longer one. I had a look online to see if anyone had a better idea for closing lingerie bags. Velcro is no good because it attaches itself to knits like a limpet to rock, and a simple buttoned fastening would have gaps between the buttons that would allow things in and out of the bag while it’s churning around in the machine. I came across this Simple Mesh Bag tutorial on the Inspired Wren’s blog. Here are the end results. I followed the Inspired Wren’s instructions, apart from a different closure and a different size of bag – I just used the whole piece of starry netting cut into two. I didn’t have any matching thread, unfortunately. The original version has a foldover top that is secured with a single press stud in the middle. I don’t have any of the type of snap that’s attached using a tool, but I do have a length of tape with attached poppers left over from making duvet covers. I liked this design immediately – the foldover opening will stay closed even through a spin cycle with just a few snaps to keep it in place, while getting things in and out of the bag is even easier than for a zip, because the whole of the top of the bag is open when the flap is folded back on itself. These lingerie bags would certainly be prettier made from a printed craft cotton like the Inspired Wren version, but once again I’ve chosen substance over style. I’m tempted to make a couple more out of the plain white netting, then I can wash just one or two pairs of socks per bag and have enough to use when travelling to prevent things like tights and silk scarves from getting snagged in a suitcase or drawer. * Marks and Spencer – knicker suppliers to more than a quarter of British women. This entry was posted in knitting, sewing and tagged darning, Drops Fabel, lingerie bag, Sacre du Printemps, socks. Bookmark the permalink. What a great solution! And lovely to boot. I’m not at all sure I’d have chosen star spangled netting if I’d had to go and buy the fabric, but it does kind of work. Such pretty bags, a lot nicer than my Poundland ones. So pretty, well done. And happy sockiversary too!